I’ve done it! I’ve gone a whole month with a blog post every day! Hurrah! Children and trains and strange noises you hear. And pains that are thought to be palindromatic. And a bonkers old lady who’s rather bizzare. Odd sounding berries and sudden cat wees. Rebus and Rankin and small sleeping bats. See you in February, folks! There’s been a bit of batty banter on Twitter. American author Julie Anne Lindsey (@JulieALindsey on Twitter) tweeted that she’d had her basement ruthlessly invaded by a bat, which brought to mind the time I got followed home by a [insert collective noun for bats here] of bats. I could just look up the collective noun for bats, but I really want it to be a ‘squeak’ and don’t want to have my illusions shattered when I find out it isn’t. Awwww! And thanks Julie for letting me include your photo! As soon as I saw that picture pop up in my twitter feed it reminded me of when I was really tiny, and was out for a walk with dad. It’s one of those moments I remember really vividly. I wrote about it once, and after a quick check I realised I haven’t included it in my blog, so here it is…. I was very small. Either that, or the hedges and trees were very big. No, I must have been very small. It was a hot, bright, sunny day, and dad and I were walking up the narrow road out of town on our way to visit the farm at the top of the hill. Sometimes there were lambs, and the farmer let me feed them from a bottle. Or was that just once? Maybe that’s what would happen next. Anyway, it was hot, bright and sunny, I was small, the hedges and trees were big, and I was with dad. We were walking on the right-hand side of the road (Always Remember the Country Code) and our progress was slow as we’d keep stopping to investigate flowers and other interesting things on the verge and in the hedgerow. Maybe I picked some flowers for mum with my chubby little hands. It was nestled in the grass under the hedge, eyes shut tight. I might have poked it carefully, but if I did it wouldn’t have moved. I showed dad, and he bent down to look – probably with a ‘Oooh, aaaaah’ – and told me it was a sleeping bat, just a little one, maybe a baby one. I’d never seen a real bat before, and he pointed out its delicate, folded wings. But why was it sleeping on the ground? 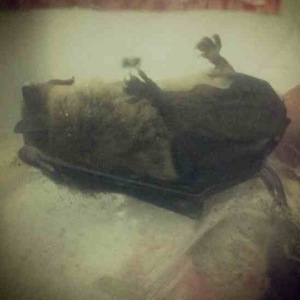 I knew bats went to sleep hanging upside-down from branches. Perhaps it had fallen off its twig? Dad agreed – or maybe he suggested that – and he gently picked up the tiny thing in his big daddy hands and somehow got it hooked on a twig in the hedge so that it looked like a proper bat again. We carried on walking. Of course it wasn’t asleep. But I must have been very small, maybe so small that dad didn’t want to explain Death to me. When I was a bit bigger and learnt about Death, I remembered that little bat and wondered why dad had lied to me. Now I’m older I know he’d just been trying to protect his little girl, and not spoil the lovely walk in the countryside on that hot, bright, sunny day, with the hedges and trees, the Country Code, and maybe the possibility of lambs to feed. My dad, my protector, with his big gentle hands. I’ll never forget that little bat. I had a lot of ‘No‘ thoughts too, but decided to blow a big raspberry at them and continue putting my splurgy-rough-stuff on here for you to dip in and out of should you feel the urge. Ellis cupped his hands around the steaming mug on the table in front of him. He’d been a bit wary about accepting a drink from someone who fried odour eaters, but he had to admit to himself it tasted good. Sort of like the best, sweetest cup of tea in the world but with essence of bubblegum and a toffee aftertaste. He took another sip, and looked carefully down at his lap where the small orange dragon was nestled; its eyes were closed, and it was quietly snoring squeakily. Every now and then a pale grey puff of smoke drifted out the corner of its mouth. Ellis had discovered that if he looked at it suddenly without thinking, it looked distinctly furry. But if he concentrated and looked at it a bit more slowly, it was 100% dragon. ‘He likes you,’ said Granny Battle approvingly, taking a noisy slurp from her mug. Whatever she was drinking was producing delicate purple steam. Ellis felt rather pleased with himself, and gave the dragon a tentative tickle behind its ear. It creaked contentedly. He had a million and one questions he needed answering, and was pretty sure Granny Battle had already heard him thinking them. He picked one at random to vocalise. ‘So why cats?’ he asked. ‘Well, I would have thought that was obvious,’ she replied, blowing on her mug and sending little purple steam-rings across the table. ‘Er, no,’ he replied. Granny gave a little hmph. ‘Heat?’ Ellis looked confused. ‘I don’t get it,’ he said. Ellis was silent. He kept getting little bursts of swimmy unrealism. He was sitting at the kitchen table in the bonkers old lady’s – he corrected himself – Granny Battle’s house. They were discussing dragons. Cats were dragons. He’d had his t-shirt singed and half his hair burnt to a frazzle. Now his shirt and hair were back to normal after she’d done something. She cooked odour eaters in a frying pan. He’d trodden in one. She said she was a slooth, and she said that she knew where his dad was. He clenched his first under the table until he felt his fingernails dig painfully into his palm, just to remind himself that this was real. Ellis was getting a bit overloaded. He just stared blankly at her. She sighed. Ellis was sitting at the kitchen table feeling odd. He couldn’t stop sneaking glances at his t-shirt which was now minus one singed hole, and rubbing the hair on the side of his head that a few minutes ago had been stubble, and was now the normal tangle. He wasn’t quite sure how she’d done it. Actually, he wasn’t quite sure if he wanted to know how she’d done it. The side of his head felt… twinkly, for want of a better word – and he was very aware that twinkly wasn’t a good word for a boy. But that’s definitely how it felt. Granny Battle gave the frying pan a vigorous shake, then turned the heat down and sat down at the table opposite him. Ellis suddenly and felt himself going red, and a little surge of anger made his head feel cloudy. ‘What do you know about my dad? !’ he said hotly. Ellis was so shocked he forgot to be shocked when Granny wiped the tip of her finger on her cardigan. ‘But… lost is… lost means… I mean…. He’s…’ he struggled to get the word out. He could feel it, at the back of his mind, but he just couldn’t say it. Granny leaned back in her chair, eyeing him smugly. Ellis stared at her, not knowing whether to laugh, cry, shout, scream or run away. Granny sighed. ‘Look, any of those would be expected, but I think the best thing would be if you stayed sat sitting there for a bit longer, and let me show you something about seeing. All right?’ She heaved herself up from the chair, bent down, picked up the orange cat, which was now looking like a perfectly normal – if slightly ravaged and battle-weary – orange cat, and plonked it down in the middle of the kitchen table. ‘Right then,’ she said to Ellis, who had momentarily forgotten his confusion and was leaning back in his chair warily and eying the cat with distrust. ‘What? !’ he said, looking at her as if she was bonkers. Which, he reminded himself, everyone said she was and he was inclined to agree. Ellis looked back at the cat, then at Granny Battle, then back at the cat. Then he gave a little shrug and stared angrily at the cat. It glanced at him briefly, then looked away and began to wash its paws. Ellis made that little sound that means ‘What am I doing here? Why am I doing this? You’re bonkers! Why don’t I just go home?’ then, seeing Granny’s grin, felt rather uncomfortable so tried to relax in his chair and just look at the cat. After a few seconds it stopped washing its paws and looked back at him. It stared back at him flatly, flicked one ear, and began to look rather uncomfortable. ‘Don’t blink,’ said Granny Battle, who’d stood up and was watching them both carefully. Ellis felt his eyes starting to water and fought the urge to blink, which was even stronger now after what Granny had just said. He felt the beginnings of a sneeze starting high up in his nose. ‘I think I’m going to sneeze,’ he said in a strained voice. ‘Don’t do that, you’ll make him jump!’ said Granny quickly. Ellis was aware of her backing away slightly, which was a bit worrying. He concentrated on not blinking and tried to force the sneezey feeling, which had crept nearer the end of his nose, back up. He could barely see the cat now for the tears in his eyes. In the split second his eyes closed, he heard the strangest, most un-catlike noise from the table in front of him, a crash from the other side of the kitchen which sounded rather like Granny falling over a chair, and something began to smell burney. He opened his eyes and saw Granny picking herself up off the floor and trying to untangle herself from a chair. One of her trouser legs was smouldering, and she patted it out with a hasty oven-glove. ‘Well,’ she said brightly, ‘Well. I was right about the sneeze wasn’t I?’ She patted out another smoulder on her trouser leg, which had re-ignited, and waved the oven glove at the table. The dragon was hunched rather self-consciously in the middle of the table in a small puddle of dragon-wee. It looked up at Ellis apologetically and blinked. He blinked back, and was only mildly surprised to find it was still there when his eyes opened again. A slow, slightly mad, grin began to spread across his face, and the dragon gave a genteel, smokey, hiccup then wrinkled its snout in what Ellis decided could only be a faintly embarrassed smile. There we go! See you tomorrow! The old station building looked more like a small cottage than a station, except for the carved wooden decorations around the roof, and a sign on the wall that was so faded and peeling he couldn’t read it. Against the wall were a couple of benches and an old porter’s trolley, crammed with plantpots which seemed to contain nothing but dead twigs and weeds. The door stood open, and as Ellis stepped cautiously inside, a few things happened rather quickly. First he noticed a smell, like a mixture of old, damp socks, smelly feet and soggy cabbage. Then a large frying pan flew over his head and clanged comically on the doorstep behind him. Finally, the small orange dragon, which appeared to have somehow attached itself to the old lady’s head, suddenly shot off and landed skittishly on the floor in front of him, wheezing hard. Ellis backed away and stepped in something that just felt… wrong. Ellis shut his eyes tight and said ‘No!’ very quietly. Whatever he’d stepped in was slithering around his ankles, exploring inside his trainers and investigating between his toes. Suddenly it stopped slithering and started to quiver. ‘I don’t!’ squeaked Ellis. The quivering got faster and faster, then suddenly it stopped, and whatever it was slithered off his feet. Ellis opened his eyes and looked down. He was standing in the middle of a splat of gloopy brown goo. He looked up at the old lady in horror. Ellis stepped out the splat as quickly as he could and ventured further into the kitchen, edging around the small orange dragon, which was now looking distinctly furry again and was licking its shoulder catishly. Ellis closed his mouth and nodded. ‘What was going on? !‘, he thought? ‘I’ll get to that,’ said the old lady dismissively. ‘I’m Granny Battle.’ She stuck her hand out suddenly and Ellis jumped. Then, as she seemed to expect him to shake it, he did, carefully. ‘I’m a slooth,’ said Granny Battle. ‘Don’t you mean a sleuth?’ asked Ellis, hearing the spelling mistake. To finish with, I’ve dug out a couple of links to previous Granny Battle-ish posts – one contains a picture of Granny Battle’s house (sort of! ), and the other has a few old sketches from my tube-commuting days to Colindale back in the early/mid 1990s – as you can see, the idea for Granny Battle has been kicking around for quite some time! Remember the Crackleberries post? With the first bit of the Granny Battle story? About a boy called Ellis? Well, here’s the next bit… once again, raw and rough, splurged out and barely edited… Hope you enjoy it! He was so surprised he got up, rubbing his bottom where the thistle had got him. Standing in front of him was a short, dumpy old lady. She could have been your common or garden dumpy old lady, were it not for the fact that she was a) as previously mentioned, sporting the loudest and ugliest pair of glasses he’d ever seen, b) wearing what looked like chain-mail gloves that reached over her elbows, and c) was gripping in her left hand a small, orange dragon by the scruff of its neck. It dangled slackly, wearing a distinct expression of embarrassment. She looked him up and down, and shook her head, tutting loudly. ‘Like what?‘ Ellis thought to himself, still being a bit too stunned to vocalise. ‘Like that,’ the old lady said, waving her free hand vaguely in the direction of his left shoulder. He suddenly became aware of the burny smell that had been tickling his nostrils, and twisted his head to look at his shoulder. There was a rather large, singed hole in his t-shirt, and reaching up to the side of his head, he found that where his hair had been been there was now a crunchy patch of stubble. Then he realised what had just happened. By the time Ellis had recovered himself enough to remember to blink, the old lady had scrambled up onto the old platform and was stomping towards a gate in the battered old white fence, the orange dragon swinging from one hand, the other hand impatiently indicating him to follow. Ellis blinked again, then for want of anything else to do, and still rubbing his thistled bottom, he heaved himself up onto the platform and followed.